I’d probably eat this Every. Single. Day. What are your go-to meals? Everyone has them, the ones you eat at least once a week or more. We choose them for their mix of taste and convenience. When you throw diabetes into the mix, the go-to meals are usually the ones where you know the exact carb count, how much insulin you need to take with them and they’re probably quick and easy. I go through phases too—eating one dish for weeks and weeks before getting thoroughly bored of it. I add the odd newbie into the mix occasionally, usually picking something I find online. I like simple dishes—a generous helping of protein, two of vegetables and fat in the form of mayo, cheese or nuts thrown in. 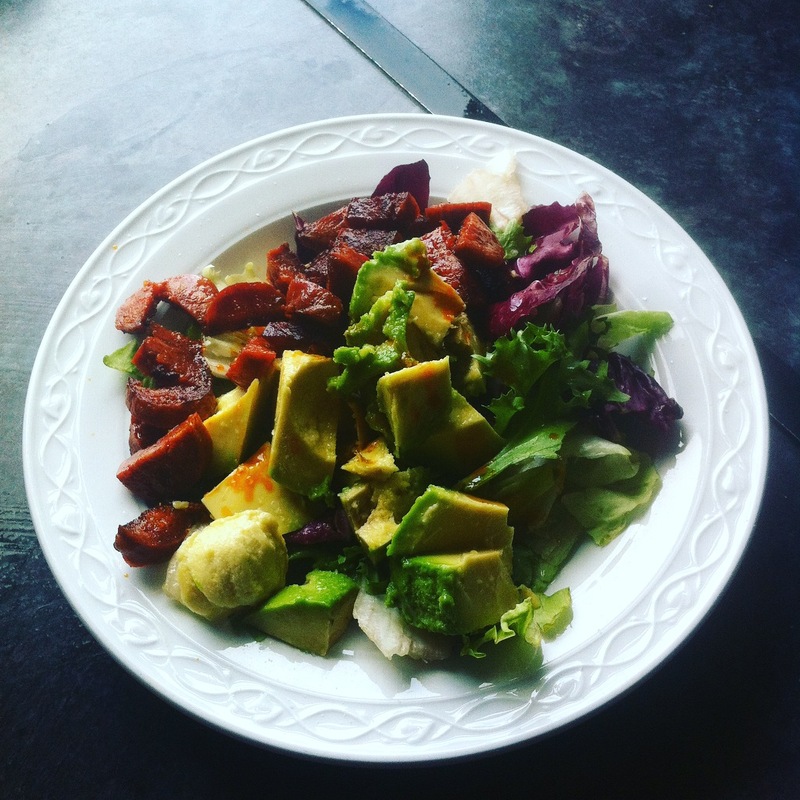 Chopped cooking chorizo fried with mushrooms on top of salad generously dressed with balsamic vinegar and a bit of chopped avocado. Roasted chicken legs with broccoli or cauliflower and…you guessed it, salad leaves. For all that we post recipes giving you lots of choices for your low-carb diet, I wonder how many of you are like me? Do you too return to the same meals time after time and are they as simple (boring!) as mine? This is an embarrassingly easy salad – so simple, it barely justifies a recipe. I thought I’d share it anyway because it’s really delicious. Do cook the chorizo, even if it’s one that doesn’t have to be cooked. If you cook the meat, then the juices and oil run and it can form the dressing for the salad. Fry the chorizo in a pan for five minutes until lightly browned. Turn frequently to stop it burning. Arrange the salad in two bowls – I use soup bowls – and chop up the avocado. Put the pieces on top of the salad and sprinkle with a little vinegar, and salt and pepper. Tip the chorizo, oil and all, on top. Allow about 8g of carbs per portion.